Train runs along the shore of Lake Baikal between Baikal station and Slyudyanka town. This route is the part of Trans-Siberian Railway. 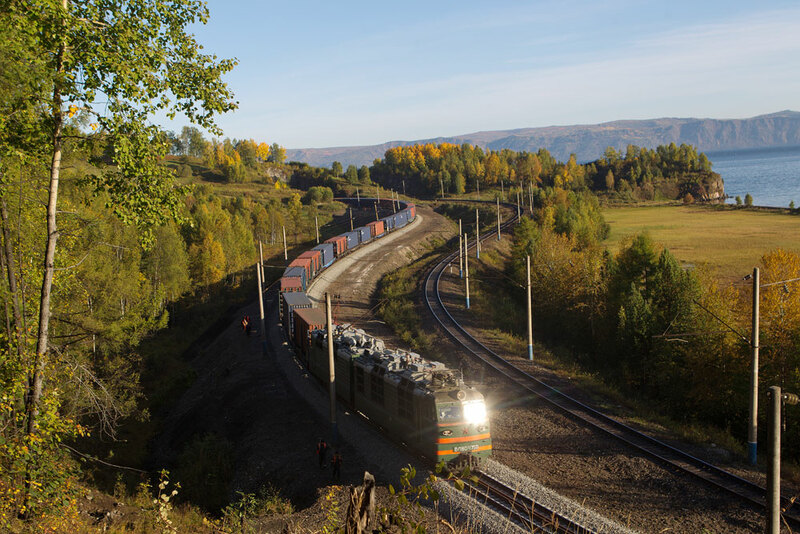 A major project aimed at linking the Eurasian Economic Union with China’s Silk Road is being plagued by the questionable economic feasibility of certain railway routes and mutual distrust between Russia and China. May 8, 2016 was the first anniversary of the signing of an agreement for a large-scale Sino-Russian political project - linking the Eurasian Economic Union (EAEU) and the Silk Road Economic Belt (SREB). It is too early to be looking for results, but the difficulties that hamper the project have already become apparent. Among the main problems are the questionable economic feasibility of certain railway routes and mutual distrust between Russia and China. Both parties looked like winners at the time of signing the agreement. Russia received a powerful symbol of support from the world's second largest economy during its confrontation with the West, a chance to upgrade its infrastructure with Chinese money and the first international agreement concluded between the EAEU and a country outside the former Soviet Union. China seemed to be satisfied with an acceptable formula to stake out spheres of influence between the two powers in Central Asia. The agreement also gave weight to the SREB initiative, which was very raw at the time. Beijing also earned goodwill from Moscow at a time when the U.S.-China rivalry was heating up. However, no real project in the framework of the existing agreement has been launched. To date, all the problems of the linking between the EAEU and the SREB can be divided into objective and subjective ones. The former are related mainly to logistics, the latter are linked to mistrust between Russia and China. The most favorable option for China is to build corridors to Europe that a train could pass through non-stop in the shortest possible time (seven to ten days). Russia and Kazakhstan, however, want the trains to stop for unloading and reloading of goods as many times as possible so that the money comes into the territories through which the SREB runs. A lot of routes are being worked out within the SREB, but so far only three are seriously considered in the framework of the EAEU. The first and most obvious is the corridor from Western China to Western Europe, coming from China through Kazakhstan and Russia to Europe, which is already partially functioning. The second is the route along the Trans-Siberian mainline through Russia's Far Eastern border cities of Grodekovo and Zabaikalsk. The third is the Trans-Caspian route without the involvement of Russia, but with the participation of Kazakhstan, which is a member of the EAEU, as well as Azerbaijan, Georgia, Turkey and Ukraine. All three routes are faced with many difficulties associated with the modernization of the infrastructure (in the first case), railways themselves (in the second), and the need to off-load cargo to a ferry to cross the seas (in the third). As a result, the total cost of transportation of one container on the first route from China to Europe works out to $3,900, on the third – $7,950 (according to the data of Aleksander Kava, an advisor to the Ukrainian Minister of Infrastructure), whereas the sea transportation of the same container costs $1,300. Regardless of the volume of investment, all these routes are unlikely to match the profitability of maritime transport, bypassing the EAEU, Timofei Bordachev, the Valdai Club’s Program Director for Eurasia, says. “A modern container ship takes about 19,000 containers on board, travels from Shenzhen to Hamburg in 24 days," he said in an interview to Kommersant. By rail, a train drags a maximum of 150 containers and travels in one and a half weeks. The figures are incomparable." Bordachev says if the main task of the SREB was an inflow of economic benefits, the project would have no prospects. Obviously, the political aspect comes first. The fear that the Russian authorities and companies have about Chinese objectives within the SREB is also coming in the way of cooperation. "The idea of the SREB evoked mixed reactions in Russia from the very beginning,” says Igor Denisov, a senior researcher at the Center for East Asian and Shanghai Cooperation Organization Studies “It looked like an attempt to pull Central Asia away from Russia's orbit." Chinese skepticism about the idea of the EAEU also has a negative impact on the project. According to a source, involved in the international expert community, Chinese officials say one thing about the Eurasian project at Russian platforms and another at international gatherings. Russian experts also do not trust the SREB. A Kommersant source in Russian Railways said the entry of Chinese companies into railway infrastructure projects in Russia was very unlikely in the near future. The linking of the EAEU and the SREB is a good opportunity for Russia to gradually integrate into international value chains. It would also help to restructure the economy, increase the density of contacts with China necessary for mutual trust, and gradually prepare for competition under the conditions of the 21th century. They will be defined by associations such as the U.S.-initiated Trans-Pacific Partnership, Veronika Nikishina, the Eurasian Economic Commission's Minister of Trade, said in March 2016. At the same time, Beijing needs to understand that Russia does not see itself either as a transit country for the transportation of goods from China to Europe or as a place for dumping dirty industries from which northern China is literally suffocating. A compromise would be to create joint ventures to upgrade the infrastructure of Russia and the other countries of the EAEU, as well as the construction of railroads, with final stops in the centers of Russian and Kazakh regions. “This format would make sense from a commercial point of view, too,” says Alexei Bezborodov. “It will always be cheaper and better to transport goods to Europe by sea, but it is quite possible to deliver them by train to the Urals and the European part of Russia.” In his opinion, such an option does not preclude the creation of transit-only routes, but they are not a good bet. “It seems reasonable that the pairing between the EAEU and the SREB should go along two tracks,” Russian Deputy Economy Minister Stanislav Voskresensky told Kommersant. “Firstly, it is the conclusion of a trade agreement with China that also involves SCO [Shanghai Cooperation Organization] members. Secondly, it promotes joint projects in infrastructure and areas that Russia sees as its strength in value chains – IT and high-tech sectors." This in an abridged version of an article, first published by Kommersant in Russian.